Choose: Size King Queen Twin Full Cal King Twin XL Full XL Choose: Mattress Height 8" 10"
The Protect-A-Bed® BugLock Plus Mattress Encasement with Secure Seal provide an economical solution for bed bug protection. It Features BugLock with Secure Seal locks bed bugs in or out protecting the mattress. This BugLock Plus Mattress Encasement has a Polyurethane Miracle Membrane lining on top sleep surface is waterproof. It is machine washable in warm or hot water. The Protect-A-Bed Buglock Plus Mattress Encasement Twin Size has many exciting features for users of all types. See the Protect-A-Bed Buglock Plus Mattress Encasement Twin Size product video and gallery images above for more details. 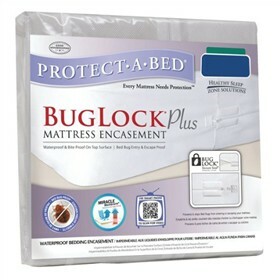 The Protect-A-Bed Buglock Plus Mattress Encasement Twin Size is sold as a Brand New Unopened Item.